Well it's offical, my oldest bear is now 6 years old! Last weekend we hosted a gingerbread house decorating party and each little guest received one of these cute aprons to use at the party and take home. These would be perfect to make and give along with a set of baking utensils for birthday presents or to make for your little kitchen helper(s) this holiday season. 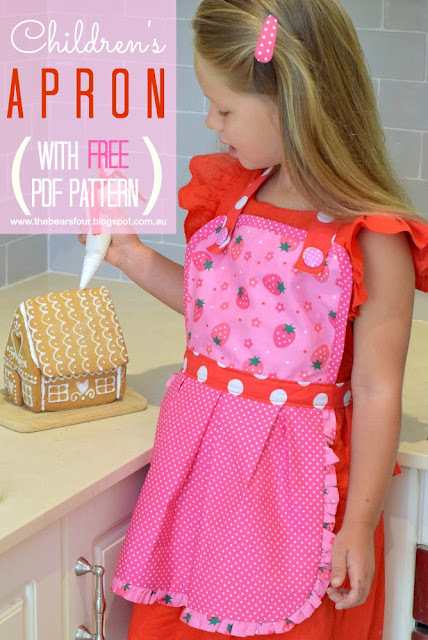 For a downloadable FREE PDF pattern and a step by step guide with lots of photos, click below. Step 1: Start by gathering your supplies and cutting out your pattern pieces. Click here to download the pattern. If you don't have access to a printer, here are the measurements for the pattern pieces. The PDF pattern doesn't include the ruffle trim, bias tape, waist band or neck strap, so those pieces will need to be cut out as per the measurements below. Cut 1 - 2 in x 35 in long strip on the bias for bias tape around the apron bib (out of apron skirt fabric) or you can purchase pre-made bias tape. Step 2: Fold the long strip of fabric for the apron skirt's gathered trim lengthways and pin and sew along the edge. Use a gathering sewing machine foot if you have one or sew a wide and long zig zag stitch and gently pull on one end of the thread to gather the fabric. You should end up with gathered ruffle trim like the one shown in photo A below. Step 9: Sew the pleats in place (Photo I). Don't worry too much about straight stitches, the top of the skirt and bottom of the bib will be covered by the waist band/tie. Step 12: Sew along the edge of the bias tape using the first crease as a guide. Sew along this crease to secure the bias tape on one side. Once the bias tape is sewn on one side, the back of your bib will look like Photo L.
Once sewn, remove the pins and the apron bib should look like photo N below. Once the bib and skirt are sewn together the apron should look like Photo Q below. Step 16: Using one of the waist band/tie fabric pieces, fold in half along the long side and then fold each of the half long sides onto itself again, as if creating a bias tape. Repeat with the second waist band/tie fabric piece. Open each fabric piece so that the middle is no longer folded but the raw long edges are still folded in on themselves. Pin one waist band/tie to the front of the apron (placing the waist band so that the centre runs along where the bib and skirt meet) and repeat with the second waist band, pinning it to the lining fabric. Try and line up the waist bands so they are roughly positioned in the same spots. Remember the waist band fabric should be wrong sides together (so right fabric sides visible). (Photo R). Tuck and pin the ends of the ties in on themselves to close up the raw edges and sew the waist band along all edges. Step 17: Take the neck strap fabric and with right sides together, sew along the long side (Photo S). Step 18: Using a safety pin, turn the fabric right side out and press with the seem edge down the middle of one side. Sew around the entire edge of the neck strap (Photo T). Step 19: Sew button holes about 1 inch up from the two shorter edges (Photo U). Step 20: Hand sew two buttons onto the bib, about 1.5 inches from the top edge of the bib and 1.5 inches in from the side edge of the bib (Photo V).